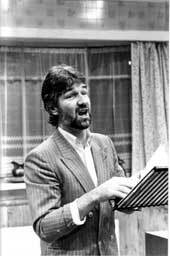 Listen to Willy reading an extract from Shirley Valentine during the 'Words On The Run' tour of 1997. 'On reflection I find it hard to fathom how someone as superstitious as myself could have agreed that in the event of Noreen ever being off, I would go on and read the text. I think it must have been a particularly fine wine night early in rehearsals and when I made a casual enquiry regarding Noreen's understudy, Glen Walford explained that it would be theatrical cruelty to ask an understudy to learn this whole one character text in the likelihood that she would never get the chance to play it to an audience - the thinking being that Noreen would never be off. 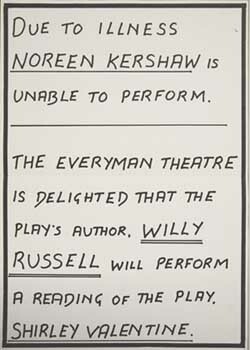 That first night the audience was told of Noreen's absence and was given the choice of having their ticket money refunded or coming in to see the bearded six foot author stand on the set and read aloud the part of a forty two year old woman. When I got onstage I was immediately encouraged to see that about eighty percent of the seats were occupied. Unknowing idiot that I was, I thought they'd excercised their option to come in and see the reading; it was only later that I learnt that on that particular night most of the audience was comprised of coach parties and that having been dropped at the theatre and their coaches departed for the next three hours the poor souls had very little alternative other than to sit it out! As it turned out that first night did work. Taking a leaf from Shakespeare's book I began the night by asking the audience to lend me its imagination - to believe that what they were listening to was not a six foot bearded man but a forty two year old housewife who has taken to talking to the wall. And the audience did just that. The magic of theatre was invoked and out of something really primitive, as basic as the single human voice, we stumbled into a kind of primal drama where all the images are provided by the audience itself. I went home that night glad that I'd done it and apparently got away with it but certainly never wanting to have to repeat the performance. And then, the next day, we heard that Noreen's stomach pains had been the pains of peritonitis, that she had been operated upon, that she was fine and recovering but would not be able to resume the part for the extended three weeks of the run that had just been announced. So that was how I came to do my Shirley Valentine night after night. It became this bizarre theatrical event and I was going on every night playing to packed houses who'd turned up to see this crazy one woman play in which there now wasn't even a woman. At the end of that year, in the Daily Post and Echo Annual Arts Awards Noreen won the Award For Best Actress.